NHL Central Scouting’s Midterm Rankings of North American draft-eligble players are out. 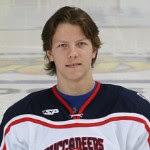 Among BU recruits, Alex Chiasson (photo) is #34, 2010 recruit Wade Megan is #130, and 2010 recruit Sean Escobedo is #208. Max Nicastro was a third round choice of Detroit in 2008 and Justin Courtnall was a seventh round choice of Tampa Bay in 2007. 2009 recruit Courntall picked up his 14th goal of the season on a breakaway as Victoria beat Alberni Valley, 5-2 on Friday. On Saturday, three BU recruits—Chicago’s Nicastro (2009) and Des Moines’ Chiasson (2009) and Yassin Cissé (2010)—got together on the ice. Nicastro’s two assists helped the Chicago Steel winning 6-4, while Chiasson and Cissé each had an assist for slumping Des Moines. Chiasson has a six-game scoring streak. Nicastro is third among USHL defensemen in scoring with 20 points (6-14) equally his total from last season. EDIT--Score sheet was changed and Nicastro had only one assist against Des Moines, but his performance in three games earned him USHL Defensive Player of the Week. "Chiasson is a player that I feel is extremely dangerous every time he touches the ice. He is very good with the puck and is an excellent sniper." "Nicastro is the type that's not going to wow you with his offensive skills, but he's very solid in all aspects of the game. I think Detroit got a nice player and if they allow him to continue to develop, they will be very happy." Jacob Cepis, who left Bowling Green last month and considered several leading Division I school to continue his education, has enrolled at Minnesota and will be eligible in January 2010. Cepis had a very good visit to BU and the Terriers were a finalist.